Chaim Soutine: Flesh highlights the unique visual conceptions and painterly energy that the artist brought to the tradition of still-life. Soutine’s remarkable paintings depicting hanging fowl, beef carcasses, and rayfish are now considered among his greatest artistic achievements. These works epitomize his fusion of Old Master influences with the tenets of painterly modernism. Virtuoso technique, expressive color, and disorienting and unexpected compositions endow Soutine’s depictions of slaughtered animals with a striking visual power and emotional impact. In 1913, at the age of 20, Soutine left his native Lithuania for Paris. He painted landscapes at various locations in France and created an important body of work in portraiture. Chaim Soutine: Flesh will present his work in still-life, from the artist’s early years in Paris and Céret, through the early 1930s, showing his development from more traditional conceptions to the impressive achievement of the paintings of the mid-1920s. Pushing the limits of the tradition, in tableaux evocative of violent dislocations, these paintings offer a tour de force of visual expression and visceral effect. 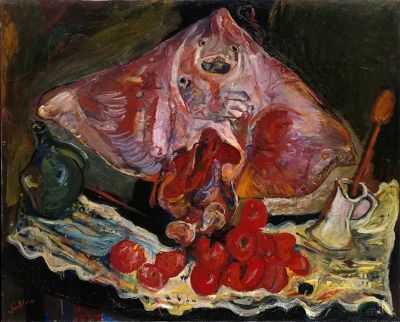 Soutine’s highly personal approach to the subject of still-life and the depictions of hanging fowl and beef carcasses were influenced by his childhood memories of the shtetl of Smilovitchi in the Russian empire (present-day Belarus), where he grew up. The strict Jewish observance of dietary laws, requiring the ritual slaughter of fowl and meat, provides a context for these emotionally charged images. Soutine’s study of Old Master paintings in the Louvre also impacted his dramatic and novel compositions of a single object isolated in space. Rembrandt’s famous painting, The Flayed Ox (1655), as well as the still-lifes of Goya, Chardin, and Courbet, were of particular importance to Soutine.